This unique shield assembly on U.S. 69 is located at the Missouri-Iowa state-line interchange. 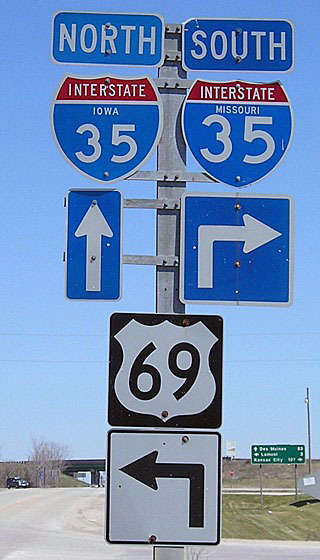 The pole is a Missouri pole, but the US 69 shield and arrow underneath are Iowa-standard. This Photo taken by Jeff Morrison (04/16/07). Photo by Jeff Morrison, 4/16/2007.